BGreaterThanU.com issues their call for inspirational stories to feature on their website. We want to tell inspiring stories to the world. Be Greater Than You announces a 'call for submission' of inspirational stories and individuals to feature and promote on their website. They are looking for those stories where people contribute personally or sacrifice themselves for the greater good of society, their families or reaching a personal goal. Anyone can submit their stories through the website or e-mail them directly. Creators ask that submissions have a short narrative regarding the proposed feature and contact information. The website uses these stories to inspire others to do the same but in their own individual way. Previous stories include the family holding a bake sale for cancer research to competing to be on the olympic archery team. "There's no better way to be inspired than real people inspiring," comments Richard May, B>U Conductor. "Sometimes, It's that simple so tell us your story." Some examples of feature stories include Vivian Saunders who runs "The Hive" teaching former gang members and at-risk youth technology skills. 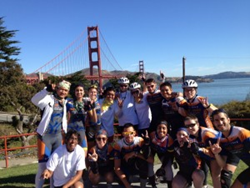 Or, the Texas 4000 bicycle team trekking from Austin, TX to Alaska raising funds for the fight against cancer. "It can be as simple as a personal goal or as lofty as helping bereaved parents through the loss of their child," adds Matt Evans, B>U Founder. "We want to hear them all of their stories and then tell their stories to the world." BGreaterThanU.com features inspiring individuals, stories and tips to become a greater self for a greater world.